If Tamil Nadu fails to exert pressure on New Delhi to stop the Sri Lankan offensive in Vanni within a few hours, there will be no hope left for civilians who fear being subjugated by the Sri Lankan military, say displaced peoples representatives in Vanni as thousands of civilians were fleeing towards Puthukkudiyiruppu from Tharmapuram and the adjoining areas as Sri Lanka Artillery (SLA) shelling intensified Tuesday. Hospital at Tharmapuram has been displaced and the streets were full of vehicles with Internally displaced civilians. There have been no reports of fighting in densely populated areas. However, the SLA has been continuing artillery attacks and gunfire. 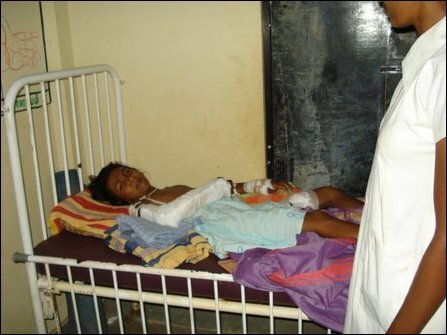 The adjoining areas of makeshift hospitals in Visuvamadu and Puthukkudiyiruppu hospital have also come under artillery fire by the SLA, which is driving civilians away from Tharmapuram and Vaddakkachchi by intensifying bombardment. Meanwhile, hospital authorities in an urgent appeal issued Tuesday afternoon have urged the ICRC to at least take efforts to safeguard the hospital premises from the Sri Lankan shelling. 28 civilians have been killed from within the 13 days from 01 January and 185 wounded. 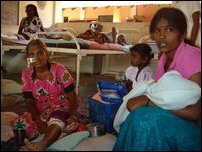 Blood was not available at Puthukkudiyiruppu and makeshift hospitals. As hospitals were displacing to relatively safer areas, there are more wounded from all corners being rushed to the makeshift hospitals functioning in schools and under trees. Puthukkudiyiruppu Road was fully busy with displacing civilians. There have also been reports of civilians moving towards Vadamaraadchi East, receny occupied by the Sri Lanka Army.